It is the gateway to the Nelson Lakes National Park in the northernmost ranges of the Southern Alps. The village attracts a lot of visitors, many of whom come back year after year to enjoy the unspoiled lakes (Lake Rotoiti and Lake Rotoroa) and explore the surrounding park. The village offers a range of accommodation, a few places to eat, a service station and an outstanding Department if Conservation Information centre. The incredible natural beauty of the area and the range of outdoor activities make St Arnaud an ideal holiday spot. The clear waters of the lakes are full of fine brown trout, which makes it a superb spot for fishermen. The lakes are excellent for kayaking, canoeing, messing about in small boats and swimming. The large eels at Kerr Bay Wharf are surprisingly tame and non-aggressive. The gliders club have chosen St Arnaud as its base, so if you fancy an instructional trial flight head down to the Lake Station airstrip. The tranquil honeydew beech forests, rugged mountains and open tussock-lands of the Nelson Lakes National Park are the real draw card. The sweet fresh air, the pure water, the tuneful birdsong, the pretty alpine flowers and the many different walking tracks for trampers of all ages and stages are what brings people back to the area time and time again. Whether you are after a 20 minute walk or a 3 day walk, a moment of solitude or a guided trek, you'll find what you are looking for in and around St Arnaud. The area is also busy in winter, serving as a base for the nearby Rainbow Ski Field, which opens from about June to October, depending on snow fall. Being very accessible, families from nearby towns head to St Arnaud at the first sign of snow armed with their sledges, toboggans and get busy having snow fun. If the area sees a few fine hard frosts the ice-skating pond is the place to be. 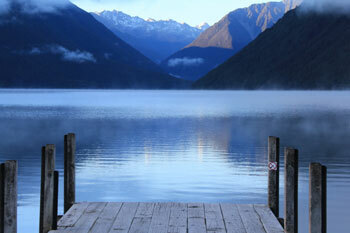 The lovely locals of St Arnaud hold 'Friendly Fridays' at either the Lake Rotoiti Community Hall or the Café. All are welcome to come along have a cuppa and meet the locals.